List books are widely considered to be high interest books for boys. The facts are laid out in an appealing manner, there are a lot of different facts and statistics to dig through and since they don’t have a whole page of black and white text some boys are more likely to read them. In case you are not sure what a list book is I will give you a brief explanation. These books have a large collection of lists on a specific topic or a variety of topics, such as 50 facts about elephants, top 10 ballparks in the United States, 45 facts about baby animals, 10 of the weirdest pets etc. Each book does it a little bit differently but essentially it is a book filled with tidbits and fact lists. There is not a lot of text and all of the books chosen are visually appealing and are super interesting. I tried to find the best books for boys – ones I thought they would really get into. Here are some list books that are perfect for your sports fans. Sports Illustrated Kids Full Count: Top 10 Lists of Everything in Baseball is a book filled with top 10 lists all relating to baseball. 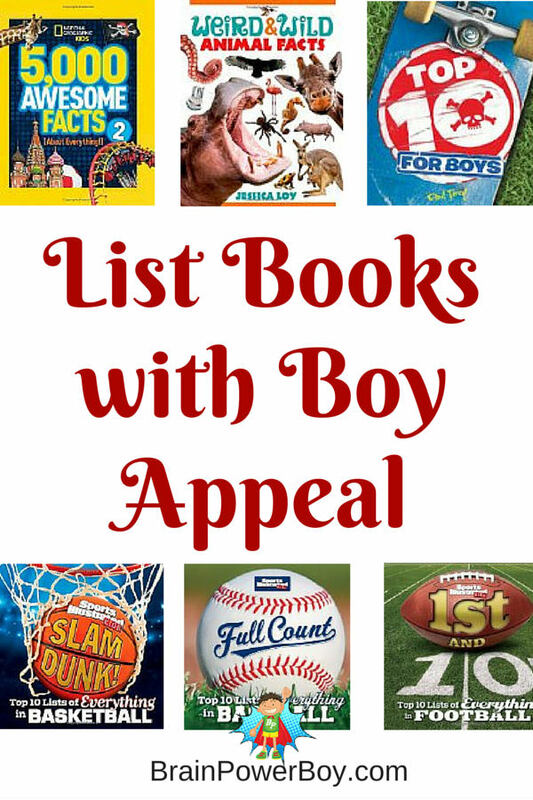 Great pictures paired with fun lists make these books engaging for boys (see football and baseball below). Sports Illustrated Kids 1st and 10: Top 10 Lists of Everything in Football includes ranking for rushers, two-sport athletes, the strongest plays and other lists about football. Sports Illustrated Kids Slam Dunk! : Top 10 Lists of Everything in Basketball is a good choice if you have a basketball fanatic on your hands. Covers a bunch topics baseball fans will enjoy such as ballparks, sluggers, stealers and more. We reviewed Top 10 for Boys earlier – click through for more information. Hint: it is great! 5,000 Awesome Facts (About Everything!) is a ton of fun to read. My son and I have really been enjoying this book. The lists are intriguing and there are interesting things that we didn’t know and things I had never even though of. Did you know that songbirds sing louder around city traffic noise or that grizzly bears can run faster than a horse? I had no idea! A visual treat, 5,000 Awesome Facts 2 from National Geographic is also sure to be a hit. Note . . . it does have one topic called Hotties in History. Really? I don’t get the point of doing things like that. It also has things like 50 facts about deadly predators, and 15 brain-freezing facts about ice cream. Topics are widely varied. Other than that unfortunate list title, it is a great book. What is popular with boys is not always popular with moms. This book is one that some moms won’t like but many boys will have a hard time putting down. Learning about animals and the facts surrounding them is interesting. Top 10 for Kids Deadly Animals Chapters include the deadliest of them all, the deadliest in the water, on land, in the sky and the deadliest predators. If you are looking for something a tad tamer, try Top 10 for Kids Pets . It is all about pets including those who are cute and fluffy and weird and exotic. These books are really quite wonderful. These books provide a lot of information in an appealing package – can’t ask for much more than that. I urge you to try these with your boys if you have not done so already. Pick one on a topic they will enjoy or try the more general titles. Many boys I know can’t put list books books down. Or . . . see them all. I think I might add those 5000 books to my own wish list! I love learning obscure facts and they sound really interesting. Well, I have to say they are really interesting. We have been reading through a bunch of the lists and I have learned a ton!